“Since wars begin in the minds of men, it is in the minds of men that the defenses of peace must be constructed". UNESCO Constitution. Towards the end of Dr. Montessori’s brilliant career, she turned her focus on the vital role of how her followers will continue the work of building a peaceful society. As a result of her efforts to create a vehicle to bringing Peace Education into all the classrooms in the world, Dr. Montessori was nominated three times for the Nobel Prize (1949, 1950 and 1951). In Montessori’s book, Education and Peace, she outlines the importance and the rights of children. In her lectures after WWII, she calls for a focus on peace education and a mission to end the possibility of war through non-violence peace education. She was an adamant advocate for the rights of children and became directly involved in the founding of UNESCO (United Nations Educational, Scientific and Cultural Organization). By the time a child enters the elementary environment, they begin the process of their human tendencies to look out into the world looking for activities that satisfies their desire to make things better. The Montessori elementary guide provides preparation for the child’s emerging need to do community service work. This can be done through various ways like ecological studies, historical studies, reading biographies of peacemakers, cultural lessons, fundamental needs of all humans around the world and time, and practical life work in and out of the classroom. Going Outs are necessary because it take the child into the world they want to be a part of and in a new framework see how they can independently contribute. The child can see with their own eyes and begin the process of figuring out their plan to make a difference. In Creo this groundwork has been set during with the children this year. We have enjoyed several successful experiences: Bake Sale for Hurricane Relief Fund, Thanksgiving Community feast (where they fed all the faculty & staff, and the children enjoyed a community luncheon and our first play production, The Quiltmaker’s Gift, an amazing story about the power of giving. Soon the children will begin actively preparing, organizing and implementing their “Peacemaking work” both in the classroom and out. Everyone will be able to freely choose a cause that resonates with their heart and compassionate views. Some program ideas that have already emerged are: Cookies for Cancer fundraiser, save the Samutra Tigers, Animal Shelter volunteer work, a homeless campaign, and help the elderly do their chores. If we let them the list would go on and on. The children get inspired be each other and are free to choose where to get involved or they can create their own initiative. The long term impact of these experiences is immeasurable. We trust it will bring us one step closer to the ideals of creating a better world. We look forward to the new beginnings for our Creo Elementary Students in 2018! Happy New Year! I hope everyone had a wonderful winter break. It was great to see your children returning back to the classroom with ease and to listen to their adventures they’ve experienced during the break. Thank you for attending our Parent Night last week where we had the opportunity to glimpse into our Elementary Montessori Sleep-over. I hope this gave you a quick glance at how we as Montessori Guides work with your children and their independence. 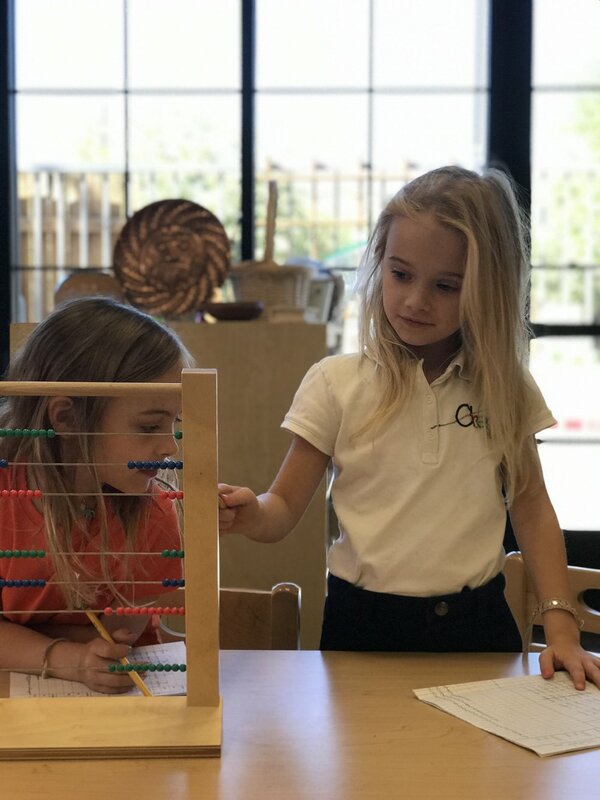 In Academics, with the understanding of the child's active imagination and the reasoning mind carrying over to the second plane we personalize lessons to each child to engage their reasoning mind that enables them to arrive at abstraction. This simply means, they will be able to understand and carry over information into future learnings with ease. Having our library procedures fine tuned, we are excited to make our Going-Out program solidify. These types of Going-Outs will make your children realize that all the answers they seeks for their projects, research or personal interest are not readily accessible in the classroom. With this concept in mind we are making the child aware of the outside world and gearing them towards independence. I hope every one will have a wonderful weekend. This month was commemorated by an explosion into writing stories and comic books. Another event that was very significant is working on a play "The Quiltmaker's Gift". The students went through all the stages of preparing the play: auditions, rehearsals, making props, etc.